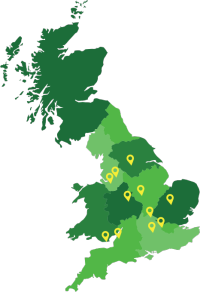 Wherever you are in the UK, we have the waste management solution for you. Envirocraft offer a diversity of recycling and waste disposal services, covering simple recycling projects to large commercial hazardous waste clearance. We are supported by a network of hubs across the nation, as well as a fleet of transport vehicles – allowing us to bring a flexible, affordable and efficient attitude to everything we do. Our environmentally conscious attitude is at the heart of our company, and we always strive to do out bit for the planet through our practices. Please get in touch with our friendly team to discover more about our services or to discuss your personal needs.